First Aid Premium Run on Black Bag Top quality rigid run on First Aid bag. Quality, long lasting design. 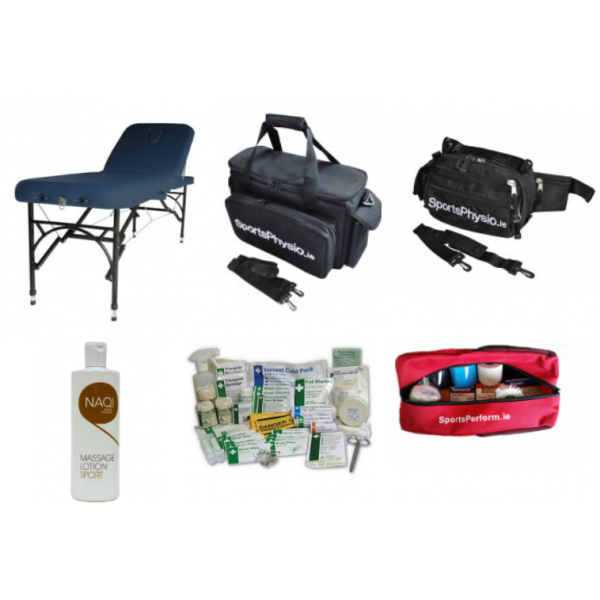 For the therapist who prefers to carry on the full bag to the injury instead of a bum bag. 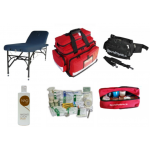 First Aid Bag SPS Multi Compartment Red As with the Deluxe this is designed for the Therapist covering regular games with all supplies clearly visible. Main compartment has 5 internal pockets including one large full length pocket for longer items. SPS Bumbag First Aid Bum Bag with internal pockets and compartments. Side pocket for cold spray or ice. Premium Quality with strong waist strap. Portable Couch Afinity Portable Couch Affinity A truly portable table at just 14.5kgs. With its rapid set up, one touch height control, the couch has been designed to be used and taken to the next appointment with the minimum of strain and difficulty for the therapist. Taping Starter Kit Ideal taping starter kit to familiarise with the different tapes available. Allows you to decide what tapes you would like to use in the future. Naqi Sports 500ml Lotion Naqi Massage Lotion Sports Especially oil-rich massage lotion with excellent gliding and dispersal properties, specially developed for extended massages such as sports massages. Particularly suited for hairy skin.